The CMA Twin Basket washer is a US sourced and is widely regarded at one of the most robust machines on the market. The CMA is designed for heavy use whilst still providing highly effective results time and time again. If you are looking for a durable dishwasher that will simply keep going with minimum fuss, the CMA is for you. The CMA Twin Basket doublesthe output to 80 baskets per hour. 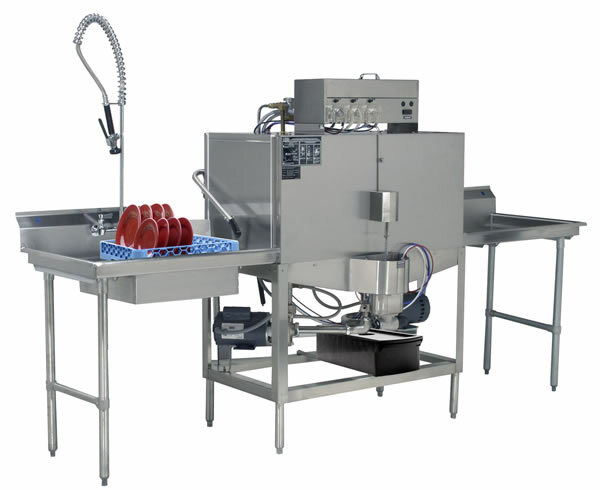 With Internal rinse aid dosing and detergent pump using both hot and cold water supply, the CMA has a fixed wash cycle of 90 seconds that will wash up to 1440 plates per hour. The CMA is delivered within 1-2 weeks and we would recommend that you use our qualified installation service. We offer 5 years FREE Parts & Labour Warranty on this product. If you choose to have this product installed by Dishwashers Direct Ltd, you will benefit both by way of installation by our qualified team of engineers and we will provide you with 5 years FREE Parts & Labour Warranty as opposed to our standard parts only warranty. We offer 5 years FREE Parts & Labour Warranty on this product unless stated at the time of purchase. Delivery of CMA Commercial Dishwashers usually take upto 1-2 weeks as they are delivered directly from the manufacturer. The price for this is included in the price of the goods unless otherwise stated. All deliveries are single man deliveries and are delivered to the door of the business.